Intimacy of Antoninus and Rabbi. A Roman emperor, and the hero of Jewish legends that recount wonderful things about his attitude toward Jews and Judaism, and more particularly concerning his friendship with Rabbi. He is called "the father of " (Severus) by the Babylonian Talmud, but which Roman emperor is actually meant by this name can hardly be determined. He has in turn been identified with Marcus Aurelius (Rapoport and Bodek), Septimius Severus (Graetz, who identifies Rabbi with Judah ha-Nasi II. ), Caracalla (Jost and N. Krochmal), Elagabalus (Cassel), and Lucius Verus (Frankel). The account in the Talmud is legendary, not historical, and no heed is given to details, or difficulties of a chronological or psychological nature. The traditional religious discussions between Hadrian and Joshua ben Hananiah, between Akiba and Tinnius Rufus, between Shabur I. and Samuel Yarḥinai, as well as the legendary interviews between Alexander the Great and the high priest Simon, or between Ptolemy and the priest Eleazar, may serve as parallels to the various Antonine legends. Jewish folk-lore loved to personify the relations of Judaism with heathendom in the guise of conversations between Jewish sages and heathen potentates. The legend of Antoninus begins with his earliest youth. The mother of Rabbi exchanged her son soon after his birth for Antoninus—the child of an intimate acquaintance. In this way she and her child managed to escape the officers of Hadrian, who were persecuting the woman because she had her son circumcised. As a consequence Antoninus imbibed with his milk a love for Jews and Judaism (Tos. 'Ab. Zarah, 10b); and it was Rabbi, the son of this vicarious mother, who served as the guide and friend of Antoninus; succeeding finally in getting him to embrace Judaism (Yer. Meg. i. 72b; B. H. vi. 130, 131). However, Antoninus, the "king," did not positively accept Judaism in its entirety until he had, with the help of his Jewish friend, thoroughly investigated its fundamental principles. Thus he challenged the Jewish conception of punishment after death by alleging that it was very easy for both body and soul to exculpate themselves. The body could say, "It is the soul that transgresses, for just as soon as it leaves me I am inert as a stone." The soul on its part could reply, "The fault is in the body, for since I have separated from it I hover like a bird in the air" (Sanh. 91a et seq. ; a shorter form, Mek. Beshallaḥ, Shirah ii.). Rabbi's answer explained the right relationship between body and soul by the parable of the blind man and the lame one ("Monatsschrift," 1873, p. 75). Rabbi also instructed Antoninus concerning the resurrection, which would take place quite differently from the usual belief which included even the intact condition of the grave-clothes (Yer. Kil. ix. 32b, Yer. Ket. xii. 35a, where the name appears as Antolinus). Antoninus puts questions to Rabbi concerning the cosmos—as, for instance, what meaning there is in the sun's setting in the west (Sanh. 91b)—as well as questions concerning Judaism proper. In like manner Antoninus could not see why the Jewish law appointed certain hours for prayer, since the latter should be offered at any time that the impulse to devotion was felt (Tan. ed. Buber i. 196); Rabbi accordingly showed him by an apt illustration. But sometimes, on the other hand, it was Antoninus who instructed Rabbi, making, for instance, the statement that while the unborn child receives its vital principle at conception, the germ of mentality and its concomitant, evil inclination, are received at birth only (Sanh. l.c.). Legend has many details concerning the personal relations between the two. There were sumptuous banquets given in honor of each other, of which the menus have been preserved (Gen. R. xi. 4, Esther R. i. 3). The emperor would take counsel of his friend prior to any warlike enterprise, as, for instance, concerning his intended campaign against Alexandria (this is told regardless of the absurdity of a war at that period between Rome and Egypt). 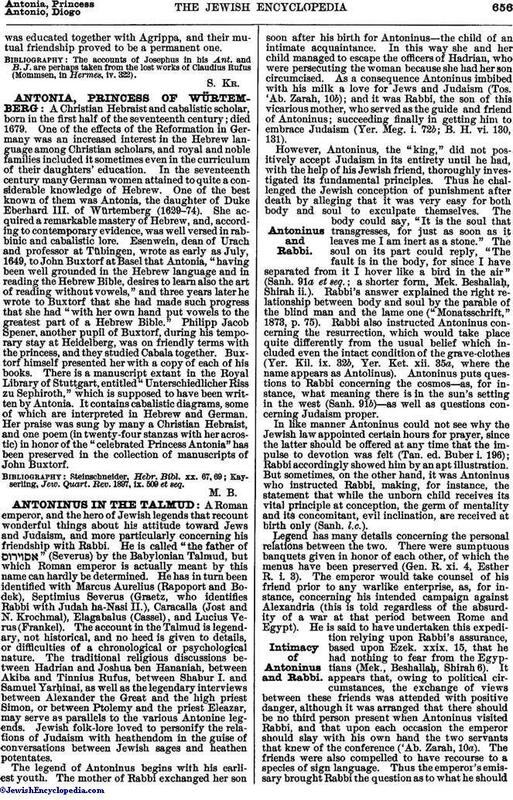 He is said to have undertaken this expedition relying upon Rabbi's assurance, based upon Ezek. xxix. 15, that he had nothing to fear from the Egyptians (Mek., Beshallaḥ, Shirah 6). It appears that, owing to political circumstances, the exchange of views between these friends was attended with positive danger, although it was arranged that there should be no third person present when Antoninus visited Rabbi, and that upon each occasion the emperor should slay with his own hand the two servants that knew of the conference ('Ab. Zarah, 10a). The friends were also compelled to have recourse to a species of sign language. Thus the emperor's emissary brought Rabbi the question as to what he shoulddo to better the financial condition of the state. Rabbi led the messenger into his garden, and without saying a word pulled up some of the large radishes and replaced them with young ones. The emperor understood the intimation; and by the removal of the heads of his financial administration he effected a wholesome change (Gen. R. lxvii.). Antoninus had two wishes most at heart: one was the elevation of Tiberias to the rank of a "colony"—probably because it was a Jewish town; and the second was to assure the succession of his son to the throne. He could obtain either but not both of these requests from the Senate; and he applied to Rabbi for counsel. Rabbi brought two men into the presence of the messenger, put a dove in the hand of one of them and bade him mount the back of his fellow. Then he said to him that supported the other, "See that he whom thou carriest lets the dove go free!" Antoninus understood the intimation: his son, once emperor, would have it in his power to raise Tiberias to the position of a colony ('Ab. Zarah, 10b). A similar answer was returned to the emperor by Rabbi in reply to his inquiry as to what he should do concerning his unprincipled daughter, whose name was Gira. The inquiry came in the shape of a plant called Gargira; that is, "Gar Gira": Gira hath gone astray. Rabbi's answer consisted of the plant Kusbarta (meaning "Kus," slay, "brata," the daughter). Antoninus replied again by sending the plant Karrathe, which word means "my extinction"; whereupon Rabbi, appreciating the emperor's unwillingness to cut off his posterity, replied by sending the plant Ḥasa, "Have mercy" (ib. 10b). The emperor's appreciation of Rabbi took the form of the richest presents, tracts of land (Yer. Sheb. vi. 36d), even sacks of gold, the mouths of which were covered with grain in order not to excite the jealousy of the Romans. 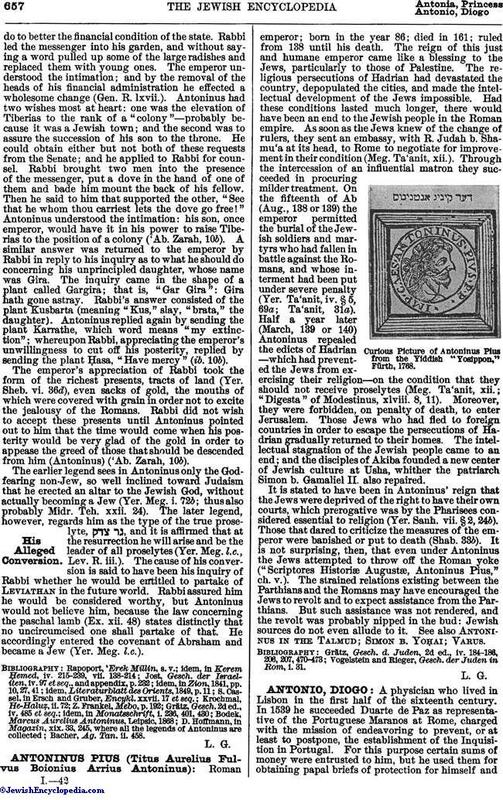 Rabbi did not wish to accept these presents until Antoninus pointed out to him that the time would come when his posterity would be very glad of the gold in order to appease the greed of those that should be descended from him (Antoninus) ('Ab. Zarah, 10b). The earlier legend sees in Antoninus only the Godfearing non-Jew, so well inclined toward Judaism that he erected an altar to the Jewish God, without actually becoming a Jew (Yer. Meg. i. 72b; thus also probably Midr. Teh. xxii. 24). The later legend, however, regards him as the type of the true proselyte, , and it is affirmed that at the resurrection he will arise and be the leader of all proselytes (Yer. Meg. l.c., Lev. R. iii.). The cause of his conversion is said to have been his inquiry of Rabbi whether he would be entitled to partake of Leviathan in the future world. Rabbi assured him he would be considered worthy, but Antoninus would not believe him, because the law concerning the paschal lamb (Ex. xii. 48) states distinctly that no uncircumcised one shall partake of that. He accordingly entered the covenant of Abraham and became a Jew (Yer. Meg. l.c.). Bacher, Ag. Tan. ii. 458.